At some point while learning 3D Cad, traditional orthographic projection views will be needed from the 3D Autocad model to create proper 3rd angle projection drawings. (Or 1st angle projection drawings.) 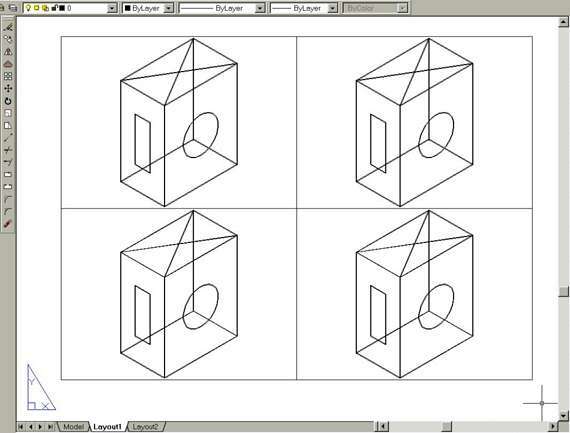 This task deals with orthographic projection views so read and follow these 3D Autocad instructions VERY carefully. For those using older equipment, if the screen does not match the descriptions or diagrams, complete the tutorials on a more powerful PC. For newer versions of Autocad, some more settings need to be in place so the software responds in accordance with the tutorial instructions. Older Autocad software is already set to behave as required. If your Autocad software does not have a 'Tools' heading in the top menu bar (see Fig Tsk 9a) the next 2 paragraphs and 2 diagrams do not apply. However, read them anyway for reference and continue the tutorial from the paragraph that starts "The creation of projection views could..."
If there is a 'Tools' heading in the top menu bar the 'options' need to be set the same as Fig Tsk 9b. Fig Tsk 9a shows what to pick to get to the 'options' window in Fig Tsk 9b. Pick 'tools' and then 'options' to open the 'options' window. On the top tabs, pick the second one along called 'Display.' Look at the checkboxes in the 'Layout Elements' part of the gray panel and set them to match with Fig Tsk 9b. The creation of projection views could now begin. However, an explanation about AutoCAD's two environments is needed. Understanding them, (called Tilemode - 1 and Tilemode - 0 on older software and Model tab / Layout tab on newer software at the bottom left of the screen), is an important part of these tutorials. (The ‘Layout tab(s) appear just to the right of the model tab, and might have a name other than layout because it can be edited.) The two environments allow designing and detailing to become two distinct activities. Enter the modeling environment by clicking the 'model' tab at the lower left. Enter the drawing environment by clicking the 'layout' tab. You will need to refer to your notes on the above when asked to enter the modeling or drawing environments throughout this training. Now enter the drawing and modeling environments in turn, and do not worry if the entities seem to vanish when entering the drawing environment. Enter each environment a few times. Look for the triangular icon when in the lower left corner. (You might have to activate it by typing 'ucsicon >' followed by 'on >.' Only the icon should be visible in the drawing environment / tilemode 0. If other entities are visible in the drawing environment, it is due to the configuration of your particular machine and they should be erased for this tuition. Zoom out, make sure all layers are visible, and erase all entities using the 'crossing' window to pick everything. After the drawing environment is empty, ensure you finish up in the modeling environment. The component up to now has been in its design phase in the modeling environment. It can be equated to being in the designers mind while creating a mental picture of the design. The only difference is the design is not just in the mind, it's on the screen as well. After the design has been created, projection views are needed to convey the object information accurately as a traditional projection drawing. It happens in the Layout / Tilemode 0 drawing environment allowing the 3D CAD model to be viewed as several projections without having to copy groups of entities. The views can include pictorial images as well as projection images. modeling environment is Tilemode 1 = Model Space = Mspace = Designers mind. Drawing environment is Tilemode 0 = = Layout/Paper Space = Pspace = Designers paper. There are only 2 environments. One for creating models and one for creating drawings. Many different names exist like Paperspace, Pspace, Mspace, Layout, Drawmode, Modelmode... etc. The different names probably arise because there are different ways of accessing each environment. Mspace and Modelmode are a prime example. They are both the modeling environment but Mspace is like a temporary version, so It has been given this different name. It all becomes clear as the Tasks unfold. Creating projection views is a 2 stage process. Here is how the first stage is done. Firstly, enter the drawing environment. When the drawing environment is active use the command shown below. The outcome should correspond to Fig Tsk 9c; four identical images of the model created in tasks 1-8. If not, read on. The 4 views are probably pictorial but not necessarily so. If each view displays something, all is well. Grid visibility at this stage is not important but blank views suggest the computer being used is not powerful enough. Try zooming. Note If some of the four Mviews appear empty, a system variable called Maxactvp governs the number of windows that can display their entities at the same time. It was used in task 2 to set the number to 8. It means 8 views are able to display images of the model. If some of the four views appear empty, ensure this value is still set to 8 by typing "maxactvp". AutoCAD will return the current value by showing it in brackets. If the value is set to 8, and views still appear to be empty, the indications are that a more powerful machine is needed. Obtaining the four Mview windows completes the first stage of the orthographic process. many people know these Mviews as viewports. This training uses the name mview, but feel free to make a note that an Mview is the same as a viewport.